Includes: Body-Solid Preacher Curl Bench GPCB329, Chrome Olympic Curl Bar OB47, 100lbs. of Olympic Weight Plates OPB: (2) 5lb., (4) 10lb., (2) 25lb., 2 Olympic Training Collars OC04. Body-Solid Preacher Curl Bench GPCB329: When it comes to isolating the biceps for maximum concentration and development, nothing beats the Preacher Curl! Preacher curls are essential for building overall biceps mass including the often difficult lower biceps. Our preacher curl bench is set to a perfect 30° angle, positioning the upper arm for maximum stretch and full range-of-motion while eliminating stress on your elbows and lower back. 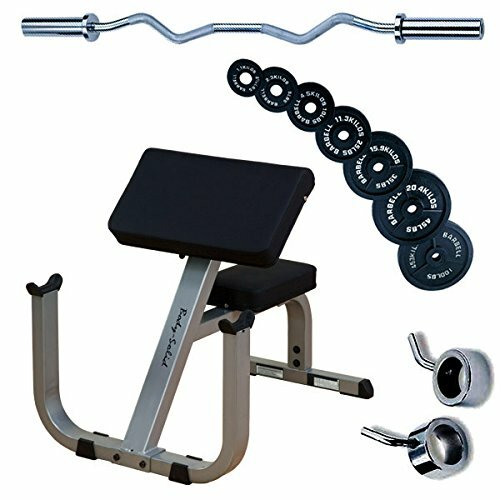 XMark ARMageddon Preacher Curl Package includes Plate Weights, Curl Bar, and Seated Preacher Curl Adjustable Bench.